I have really bad back pain that gets worse and worse everyday. I had an MRI on my shoulder a few years ago and they did a full scan of my back and found that I have degenerative disc disease in my lower spine, and I did have a lot of pain in my lower spine, sometimes when I bent over my back would lock up. I knew the pain was there, but I was at that doctor visit for my shoulder. Anyway, since that MRI, the pain has gone up my spine. Right now the pain that I feel the most is near the top of the middle of my back, but not all the way to the top, yet. So what I’ve been doing besides using the shiatsu massager and my desk chair which has vibrating massage is I will lean against an ice pack. That really helps, trust me, but I have been told to alternate cold and heat. We have a heating pad that I bought at Walgreens that crapped out on me after a few uses, and of course I had long since thrown the receipt out so I couldn’t return it. 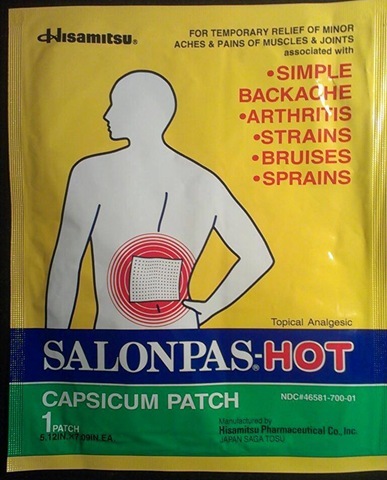 Instead of using a heating pad, I thought that perhaps a patch would help, so I bought a couple of these Salonpas hot patches at Albertson’s for only $1.79 each plus tax. Yesterday after I finished with the ice pack, I put the patch on myself because my partner was sleeping at the time and I didn’t want to wake him up, but I put it on crooked and it was way below where I needed it to be so it didn’t really do me any good. Although when he woke up I asked him to remove it and put it up higher, but removing it took away all of it’s stickiness, so it kept coming off. Today I asked him to put it on me so it was on right and he did and I can’t even begin to tell you how good it feels. I normally experience pain most when I am sitting in my desk chair typing, like now, or when I am walking. The only pain I am feeling is from the heat from this hot patch, so it’s not too bad. I haven’t gone for a walk yet, but I did walk to Albertson’s to buy 5 more of these along with my other groceries and my back didn’t give me any pain then either. So I don’t know if the heat helps stop the pain, or if it has some kind of medication in the patch that helps the pain. I can’t read the ingredients list and I’m too lazy to Google all of those words lol. At any rate, it sure is helping me and I really love it. I don’t like having to spend a lot of money buying patches, but it sure does beat having to buy heating pads that crap out on you and using electricity AND not being able to bring the heating pad with you out on walks. I really like that it’s on me until I take it off, which it says I can wear for up to 8 hours. I wonder if it will be hot for 8 whole hours? I’ll have to find out later tonight when I take it off before my bath. By the way, I am not a spokesperson for Salonpas or Hisamitsu and I have not been paid to write this post. Opinions expressed here are my own. Have I finally hit my plateau?